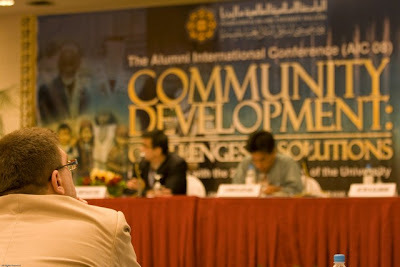 The conference named Alumni International Conference 2008 - Community Development: Challenges and Solutions. 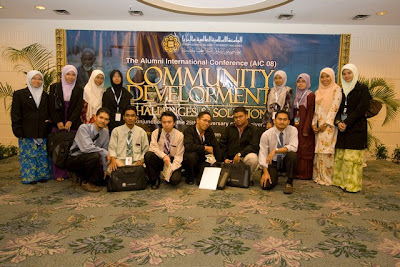 The students from KOS and KOP (i mean Kulliyyah of Pharmacy) representing their respective kulliyyah. These people include students from Kulliyyah of Nursing. The great and talented photographer is the one sitting, left most. Thank you Azri for the great pictures! Credit to Azri for the pictures. TQ! *didn't I say I'm busy? Yes, I am. I wish I could write more than just captions for the pictures. dia pakai kamera ape ntah. dia ni professional photographer kak.. no wonder la..
patutnye tulis KOS tuh KoS.. ape lah, hahaha..
owh...jgn curik camera my bro (si azri)..kang akak dia nih "kopak" lagik...pls dun ever do so =p. hehe..i knew that incident. Poor transportation..eheh. I couldnt help him..was in melaka that day.